Timelink has developped strong know-how in synchronizing large distance sites through developping and installing the European Kourou space center synchronisation system and several military test centers. Timelink has been managing the Kourou space center time system (UTC and Countdown) for 20 years, including the master reference clock, the slave clocks distributed over the differente sites in the world, the time distribution systems and the time displays. The selected solution is based on a 6U Timelink modular system allowing distributions of large amount of signals such as IRIG-B, PPS, Frequencies (1Hz, 10Hz, 100Hz), and digital time over ethernet. It features fully isolated network NTP ports. 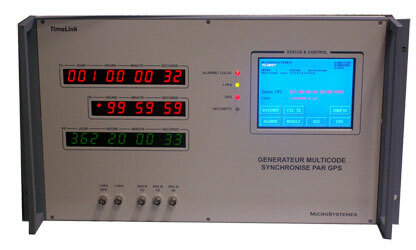 It connects to robust time display fully designed and manufactured by Timelink capable of handling several time such as UTC, Countdown and H0. The synchronization system also includes a PC based MMI for monitoring and control. Aditionnal equipements such as low cost NTP servers synchronized by the master clock, dedicated protocol conversion equipement, redundant power management equipement are also part of the system. Timelink has installed Test Centers requiring <1us synchronisation capability over long distances (several kms) using optical fibers. The selected solution is based on a 3U Timelink modular system allowing flexibility in terms of generated signals. It is based on a master clock featuring a high quality Rubidium pilot which guarantee stability in free running mode. It can manage Local Time and Countdown and optical fiber synchronization with the slave clocks. Each clock controls robust time displays adapted to the specific IRIG-B format used, NTP servers featuring fully isolated NTP ports (hardware isolation), PAL video incrustator and IRIG-B distributors which convert digital time to IRIG-B time for security rooms.